The Mount Pleasant Mansion in Fairmount Park, site of the 2016 Brooklyn Brewery Beer Mansion. This year’s Beer Mansion will be at the Woodlands Mansion and Cemetery in West Philly. Chef Andrew Gerson and his team at Brooklyn Brewery love beer as much as any hops-head, but lately, they just haven't been going to many beer festivals. Because, really, if you've seen a couple, you've seen 'em all — for the most part, anyway. "You walk in, you taste a bunch of stuff, you get too drunk, and it just doesn't appeal to us as much," says Gerson, a Mount Airy native. "We want to go to great parties. We want to hear great music. We want lawn games. We also want a little education, and we don't want it jammed down our throats." 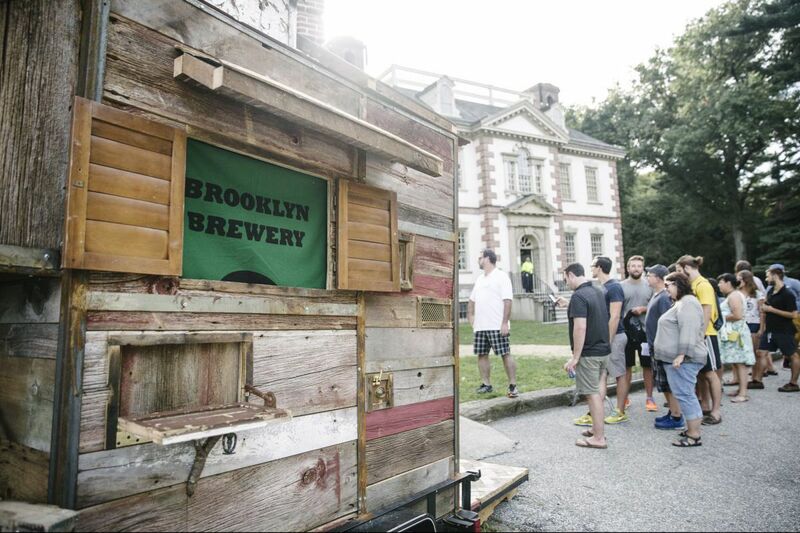 Noble goals, but you'll probably still be able to get too drunk when Gerson and the Brooklyn Brewery Mash crew bring their Beer Mansion to Philly's Woodlands Cemetery and Mansion (4000 Woodland Ave.) on Friday and Saturday. But the Brooklyn team hopes this will be a more interesting way to get inebriated than your typical beer party. Designed as a kind of cure for the common beer festival, the Beer Mansion will feature suds organized across five rooms, plus food, games, and entertainment. Rather than group beers by style, Gerson says, Brooklyn created a theme for each room to avoid a "stagnant" feel. The Tart of the Tropics Room, for example, will offer sips of sour and fruity ales and IPAs amid aquariums and palm trees. The Forest Room will have hoppy lagers, piney IPAs, and American brown ales. Dark-beer fans can head over to the Darkness Room for black lagers, stouts, and porters. For some lawn games and session beers, the Stoop is the place. For a little brain food with your booze, the Anatomy of a Beer — complete with a beer tasting and immersive trip through the brewing process — is can't-miss. "You kind of walk through one of our beers," Gerson says, "and you learn about kettle-souring techniques, and different wild yeast strains, and delve deeper into what is to some a mysterious process." Though the rooms are the same at all the Mansion tour stops this year, Brooklyn hopes to take the unique Woodlands location into account for the Philly event. Which means cemetery tours as a possible activity, Gerson says. "There is such a rich history and culture here, and this is a space the people know about, or live close to in West Philly," Gerson says. "But they don't really interact with it unless, unfortunately, they're there for a funeral. This was a way of celebrating that space and letting people immerse themselves in it." Brooklyn, of course, will have many of its own beers available at the stop, including rare Ghost Bottles and the newly released Kiwi's Playhouse. The brewery has also partnered with Philadelphia breweries to showcase their beers — and it's not the usual Philly brands, like Yards and Victory, that you might expect. Instead, look for brews from local upstarts such as Levante Brewing, Evil Genius Beer Co., Free Will Brewing, and St. Benjamin Brewing Co., plus cider from Kurant Cider. That lineup, Gerson says, helps give attendees a look at lesser-known, though no less great, breweries. "We love the Philly staples," he says, "but we wanted to mix it up a little this year and offer something new." As for food, Gerson is getting a little creative, with some help from a spin-art machine for an off-the-wall dish that is equal parts childhood arts-and-crafts and culinary experimentation. The chef will create a spin-art base out of sauces and emulsions before plating a small bite on top, the goal being to give attendees a playful, interesting take on beer-festival food. Guests will also be able to use spin-art machines to make their own coasters. That plating is an extension of last year's main dish, which had Gerson constructing bites literally in the hands of festivalgoers as a way to highlight the tactile sensation of eating. The purpose of the two plates is the same — only the inspiration is different. "The overarching goal is to create wonder, and help people respect and enjoy and play with their food," Gerson says. "And I've got a 16-month-old at home, so kids' games are more on my mind than ever before." For something a little less artsy, the Mansion will have food available from local restaurants, including Bar Amis, Local 215, and Revolution Taco. Fro snacks, there will be a tortilla chip wall from Garden of Eatin', DiBruno Bros. cheeses, and Lawless Jerky. There will be a Bloody Mary bar from McClure's. Entertainment will be by bands including Grubby Little Hands, the Orange Drop, Mumblr, and Marge. This year's event builds significantly on last year's festival, which took place at the Mount Pleasant Mansion in Fairmount Park as part of the brewery's Brooklyn Mash events series. Gerson says Brooklyn cut the usual series to one event — the Mansion — from several to concentrate efforts on throwing the biggest beer party it could muster. Now, Philly is reaping the benefits. "We're taking the energy from six separate events from throughout the week and concentrating it into one," he says. "It's our heart and souls going into these couple days." 6 p.m. Aug. 11 and 12, Woodlands Mansion and Cemetery, 4000 Woodland Ave., Tickets: $65, 215-386-2181, brooklynbrewerymash.com/philly.